It was only in the Middle Ages in Britain that the use of surnames became popular. With the growth of societies, personal taxation and the development of documentation, a better approach was needed to distinguish one family from another. People started to use their father's name, their trade, their place of residence, or some physical or personal characteristic as a second family or surname. The English surname ‘Rigg’ is a very old English topographical surname being used for someone who was literally a 'dweller by the ridge'. Its derivation is from the Olde English pre 7th Century word "hrycg", meaning ridge, in Middle English, "rigge", although in some areas of concentrated Scandinavian settlement in the UK, the name may come from either the Olde Norse "hryggr" or the Old Swedish "rygg". Records of the Rigg surname date back to the 12th Century, the first recorded spelling of the family name is shown to be that of Geoffrey de la Rigge, who is present in the Hampshire Pipe Rolls of 1166, during the reign of King Henry II, The Builder of Churches, who lived from 1154 - 1189. In 1197-98, one William De Rigge is also listed in the Pipe Rolls. There is also a record of a John del Rigg in the Subsidy Rolls, in 1332 and in 1601, a Thomas Riggs was registered at Oxford University. In September 1555, Jenet Rigg and William Sowraie were married in Ulverston, Lancashire, and in 1590 Clement Rigg of Hawkshead was recorded in the Lancashire' Wills Records at Richmond. Rigg is also the name of a village near Dumfries, Ayrshire in Southern Scotland and people from that place may have adopted the surname. Scottish church records of the 18th Century in Fife and Midlothian include a number of people named Rigg. There appears though to be no known church records of Riggs further North than the line of the Clyde and Forth estuaries. 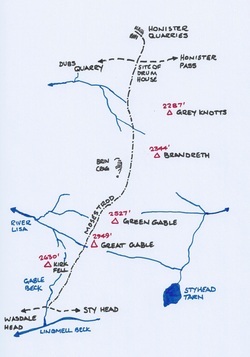 The route of the Moses Trod footpath. Moses Rigg is a mystical character who in the 1780's worked at the Honister Slate Quarry when roads were primitive and slates were moved by pony sleds. He was responsible for transporting the slate produced to Wasdale and the port of Ravenglass. 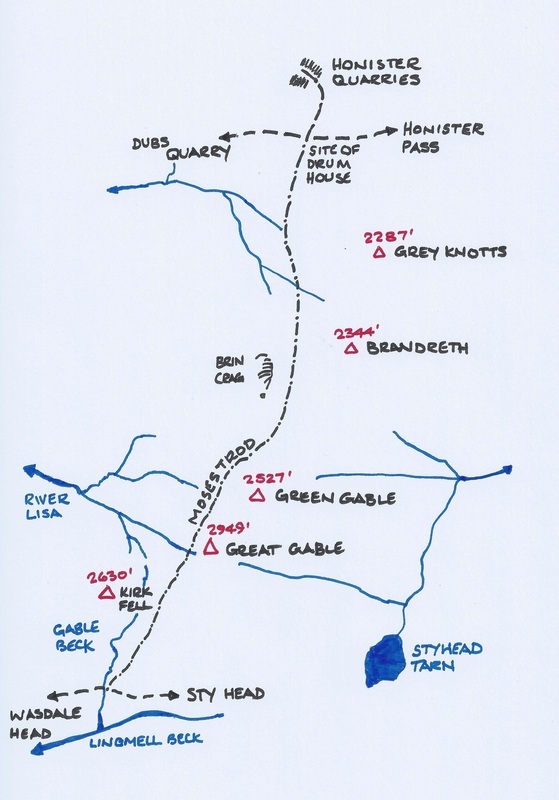 He worked out a high level route - Moses Trod - amongst the mountains leading from Honister, heading south and westwards skirting around Green Gable and Great Gable, and then descending to join the path to Wasdale Head and beyond. Only a few men in history are remembered by having their names preserved because of the paths they created and established, and Moses Rigg is the only instance in Lakeland. As a sideline, Moses illegally distilled whisky using bog water and smuggled this produce, conveying the illicit liquor down to Wasdale Head in loads of slate. Whether this was in pony panniers or on a sledge is not known. His ‘still’ must have ranked as the highest building in England for it was located quite incredibly at the top of Gable Crag. Moses also reputedly used to smuggle graphite from the mines on Grey Knotts above Seathwaite in the Borrowdale Valley, which were protected by armed guards for it to be sold in the back rooms of Keswick's Taverns. Away from fells, footpaths and packhorse routes, Rigg is a common family name in this part of the country with distinct and separate families using the surname. The Rigg Family of Southwestern Lakeland © Michael Rigg 2018.